There are numerous factors that go into the way an investor builds an investment portfolio. But one of the most telling, and most thoroughly effective, is investor knowledge. The more an investor knows and understands about investing, the more likely they are to create a diversified portfolio to take advantage of all of the different values certain products and services offer. 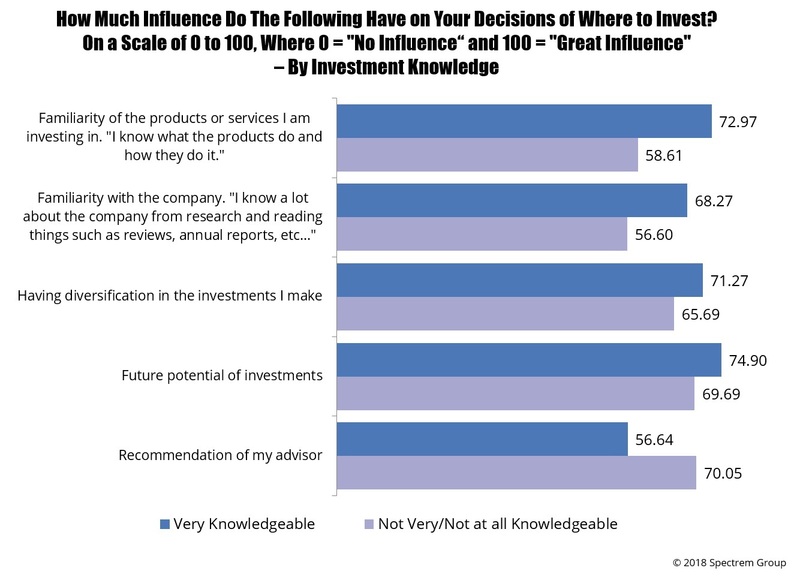 As detailed in Spectrem’s 2018 report The Influence of Knowledge and Investment Risk on Advisor Usage, knowledgeable investors are more likely to take risks because their level of knowledge and understanding make them believe the risk is worth the reward, and they are also less likely to depend upon an advisor to tell them what investments to make because they believe they know as much if not more than the advisor does. Spectrem’s latest study into the background of affluent investors’ portfolios, Portfolio Decision Making, illustrates the effect of investor knowledge on investment structure. “Our study segmentation is invaluable in understanding how investors make decisions, and when it comes to the result of an investor’s portfolio, few ingredients are as demonstrable as the impact of investor knowledge,’’ said Spectrem president George H. Walper Jr. The study digs deep into the specific decisions investors make, and each one of those decisions shows how knowledge impacts that particular product or service. For example, when asked whether an investor prefers individual stocks (measured at “0” on a 0-to-100 scale) or bundled stocks in mutual funds (measured at “100” on the same scale), those investors who consider themselves very knowledgeable rank their choices at 51.71, right down the middle of the road. Those investors who are not very knowledge rate themselves at 61.26, pointed more toward funds. Asked to explain why they prefer individual stock investments, those investors who consider themselves very knowledgeable answered “I want more control over what I am invested in” (60 percent) and “the chance for greater appreciation” (57 percent). Those answers indicate a desire to be in charge of the investment process and a desire for greater return on investment, which indicates a greater appetite for risk. There is a continuing conflict between advisors who want to educate their investors about what they are doing and why and the understanding that knowledgeable investors shy away from advisors. Advisors who grasp this concept can provide guidance to knowledgeable investors, providing additional insights to add to the investor’s background information that will allow the investor to make wiser choices and perhaps cause the investor to appreciate the advisor as a source to go to when specific questions appear. Asked to place upon a 0-to-100 scale the influence outside factors have on investment decisions, those investors who claim to be not very or not at all knowledgeable listed the influence of the advisor as the most important factor, at 70.05, an almost unheard-of level in Spectrem research. For very knowledgeable investors, the influence of advisors was 56.64, just above the midpoint. Those investors were more likely to select “familiarity with the product”, “familiarity with the company” or “performance of the investment”. Those are all factors a knowledgeable investor would have available to them and an unknowledgeable investor would not. Portfolio Decision Making shows how knowledgeable investors are in a better position to take advantage of market indicators and trends. The best example of that comes in questions about the Great Recession in 2008. Investors were asked how they reacted to the stock market decline, and while many investors did not react, and many other simply followed the advice of their advisor, 19 percent of the very knowledgeable investors “invested more as the market declined”. Over time (as the following 10 years have shown), those investments probably paid off. The Spectrem study demonstrates hundreds of examples of the influences and factors that go into the process of creating or manipulating a portfolio. But the knowledge factor is one that advisors can easily use to their benefit, but being a source for greater knowledge leading to more and wiser investments and a positive relationship between the advisor and the investor, who might otherwise be reluctant to consider an advisor as a source.